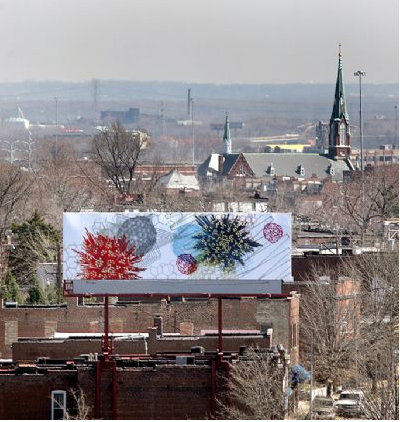 Amanda Hughen, Binary Convergence, 14 x 48 feet, billboard, St. Louis, MO, 2010. Photo 2010 © John White, St. Louis Post-Dispatch. In 2010, Good Citizen in St. Louis invited Hughen to create an artwork for a 48 foot wide billboard. The resulting artwork, Binary Convergence, was up from March through July of that year, and is part of Hughen's Biotransformation series.